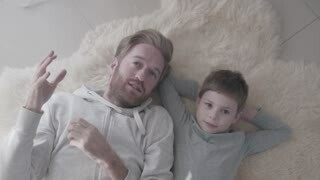 Bearded daddy and his little son lying at the white fur carpet and have interesting conversation. Father talk with his kid like equal. Father-child relationship. Smilling bearded father and his little son lying at the white fur carpet and have interesting conversation. Father talk with his kid like equal. Father-child relationship. 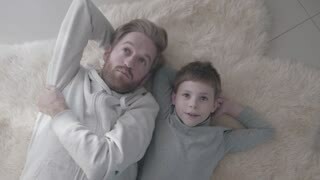 Bearded father and his little son lying at the white fur carpet and have interesting conversation. Father-child relationship.